It’s well known fact that the Linux mascot is a penguin, named Tux, but did anyone wondered how did the tux became the linux mascot? I’ll tell one thing about Linus Torvalds, He likes to Dive. I mean, he really likes to dive. 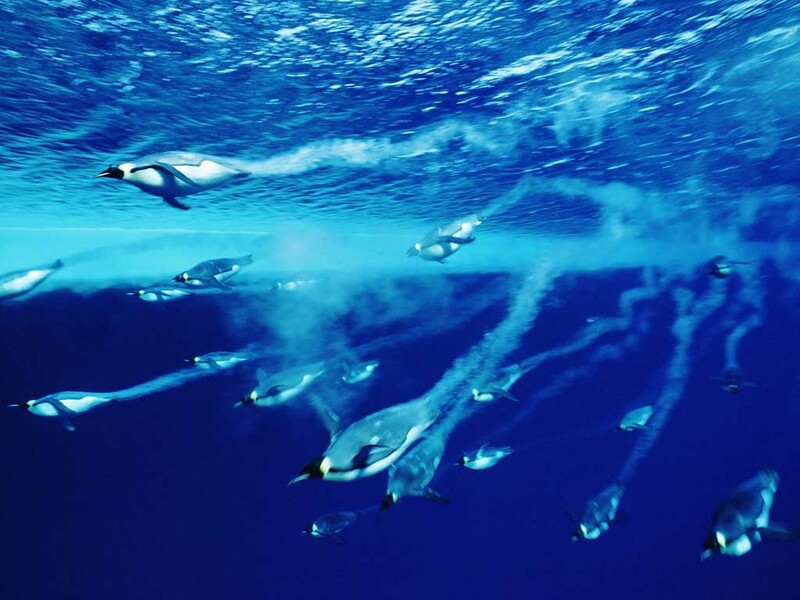 and Penguins also dive. Proof? So Linus was diving around and realized that Linux didn’t have a proper Opensource Software for organizing Penguins sightseeings, What he did? He wrote one. That’s what subsurface is all about. A Dive Log application from Divers, for Divers that works on Linux ( And on Mac and Windows too ). It supports acquiring the dive – data from most of the dive computers that are selled around the world via the awesome libdivecomputer, and also is pretty sleek. It was mainly written in Gtk till version 3.0, but now it’s ported to Qt ( 4.0 for the time being, since we rely on marble for the globe ) but plans for 5.x are being discussed. But since Subsurface is not a ‘KDE’ app, why the hell it’s here on planetkde? And While we prepared Subsurface we also killed a few Qt and Marble bugs ( upstreamed ), what about that? More information? Go to the subsurface webpage. It’s been a long, long while since I don’t blog here, and most of my old blogposts were about Rocs, well.. not anyomore. I joined the Subsurface team about six months ago. It was a program written in Gtk mostly by Linus Torvalds and Dirk Hohndel, and they were opened to switch to Qt, why… why shouldn’t we jump ahead and help the transition to be smooth as it could? So Thiago Macieira and Myself jumped in to help, And it’s been a lot of learning from all sides. It’s been quite a while – but we have been hard at work. 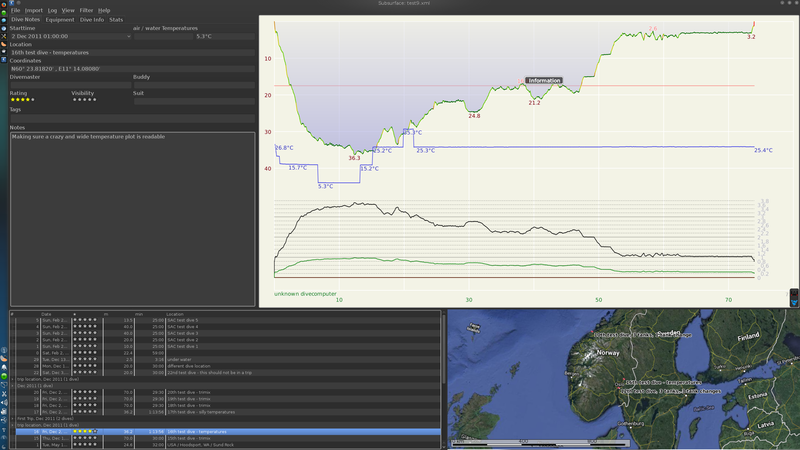 We have migrated Subsurface from Gtk to Qt over the past 6 months. And given the magnitude of this change, we decided to go with a public beta (or two, or three, depending on how things go) before releasing Subsurface 4. I don’t even know where to begin. This is a complete rewrite of the UI. The basic concepts are the same, most of the basic features are the same, but trying to create a concise list of changes that summarizes the more than 1200 commits that have gone in since 3.1 seems a daunting task. does require that you speak a language besides English) can help with translations. Please send us email at subsurface@hohndel.org if you would like to contribute. You can find Windows and Mac binaries at the usual downloads location. Linux users are more likely to have to build from source. Get the source from git and follow the instructions in the INSTALL file (not from this website, those are still for the Gtk version). Working with the Qt community has been a blast. +Linus Torvalds still may not be a huge C++ fan – but even he submitted C++/Qt patches. Who would have thought. It’s been a long time since my last post (as usual 🙂 – hopefully that’s going to change in next months). A lot of things have happened in QtModeling land tough. In case you haven’t read my previous ‘call for arms‘ and ‘XMI serialization and metamodel plugins‘ posts, QtModeling is intended to provide a complete and flexible infrastructure for software (meta)modeling, (automated) architecture design and analysis, model recovery, and whatever comes in mind when you think about software models. Although we are still far from have those features fully available, some interesting capabilities are quite functional. The new refactored templates for automatic metamodel implementation make programmatic model manipulation easier by taking ownership of properties with ‘composite’ aggregation and automatically removing elements from all involved property lists when it’s deleted. While Qt properties features described in QTBUG-17301 are still being considered, QtModeling extends Qt property system by defining roles for aggregation, opposite association ends, redefined and subsetted properties, and derived and derived union constructors. Some UML functionalities defined as derived properties/operations still miss implementation but basic features involving class and components diagrams are already in place. XMI serialization, profiles and stereotypes definitions/applications, and imported elements/packages are also currently available. QtModeling: defines base classes for model elements (QModelingElement and QModelingObject) and QXmiWriter/QXmiReader classes for XMI serialization. 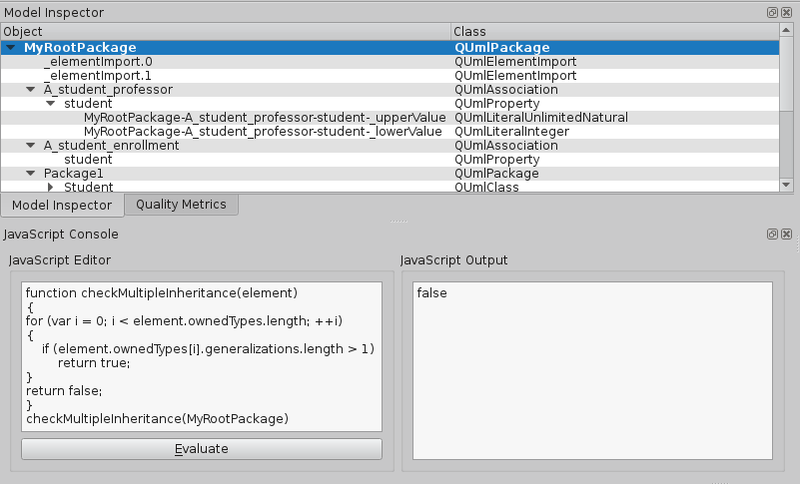 QtModelingWidgets: provides two new model classes (QModelingObjectModel and QModelingObjectPropertyModel) and two new view classes (QModelingObjectView and QModelingObjectPropertyEditor) for manipulating models and model element’s properties. 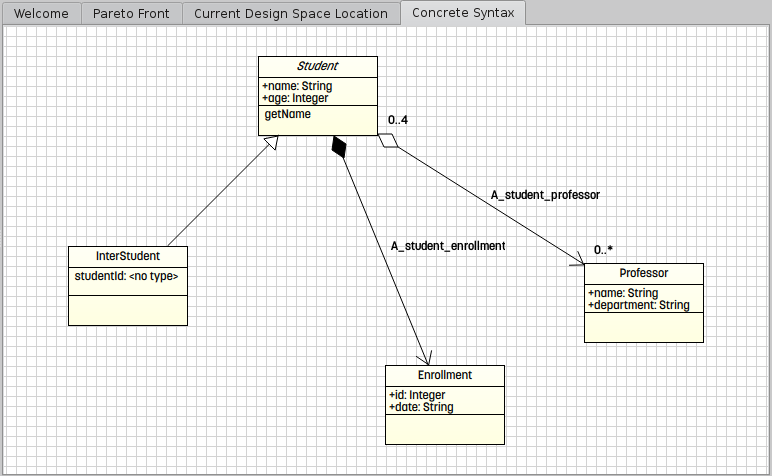 QtUml: implements the full UML 2.4.1 metamodel. It comprises 239 classes which are 91.83% automatically implemented by templates. The remaining code represents derived properties and are being implemented on demand. QtMof: implements the full MOF (Meta Object Facility) 2.4.1 metamodel. It comprises 51 classes also almost entirely implemented automatically. 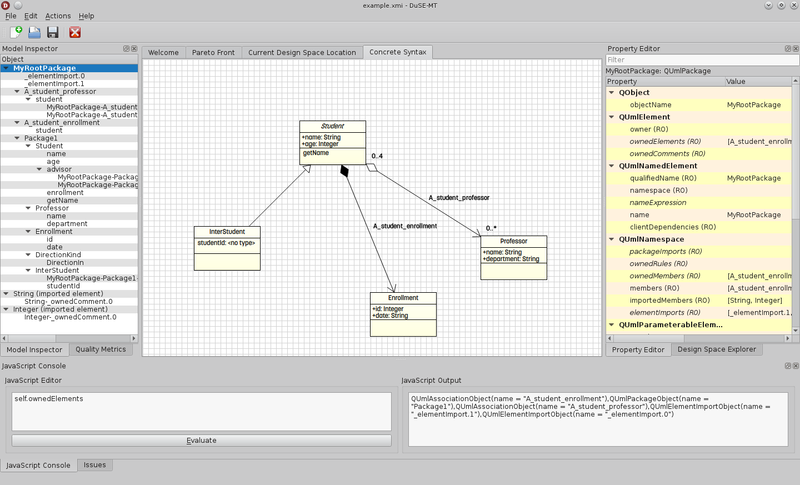 QtDuSE: implements the DuSE language/metamodel (part of my PhD research) for automated software architecture design and analysis. QtSADuSEProfile: defines an UML Profile for automated software architecture design of self-adaptive systems. This is required by SADuSE – a specific DuSE design space instance devoted to self-adaptive systems design. Qt metamodel plugins: bind the previous model modules as Qt plugins used during XMI serialization. While a full OCL parser isn’t already available, such kind of scripts can be really useful (actually it’s even more expressive than OCL since it’s not limited to read-only operations). case 0: return " "
… where Relationship is a new QML item we implemented based on QPainter API (I still need to learn how to use the new SG API). With such things done, UML concrete syntax implementation becomes the simple creation of QML files with names matching the corresponding UML metamodel element (UmlNode, UmlState, and so on). Supporting automated architecture design involves, among other things, the use of some search-based approach to find out several candidate architectures and then choose one that satisfies some specific quality attribute criteria. Elitist population-based algorithms have been successfully applied in such scenario because of their improved performance and fast convergence. If you’ve already played before with JMetal or some other framework for multi-objective optimization, that’s exactly what QtOptimization is intended to be. Currently, only NSGA-II (Nondominated Sorting Genetic Algorithm) is implemented (QNsga2 class), in conjunction with classes for bitwise mutation (QBitwiseMutationOperator), crossover (QCrossoverOperator), polynomial mutation (QPolynomialMutationOperator), simulated binary crossover (QSbxCrossoverOperator), and tournament selection (QTournamentSelectionOperator) operators. We’re currently implementing some quality indicators for Pareto-fronts and finish integration of such features in DuSE-MT in order to support better automated architecture design and analysis. So, interesting stuff coming … I’d really love to see those things effectively integrated in QtCreator, KDevelop, and Umbrello. If you are willing to join the effort, fell free to try it from gitorious and don’t hesitate to contact me if you face any trouble.